A police program that sees police officers and Aboriginal elders connect with the homeless downtown is giving back to the community after receiving a grant from the City of Toronto. 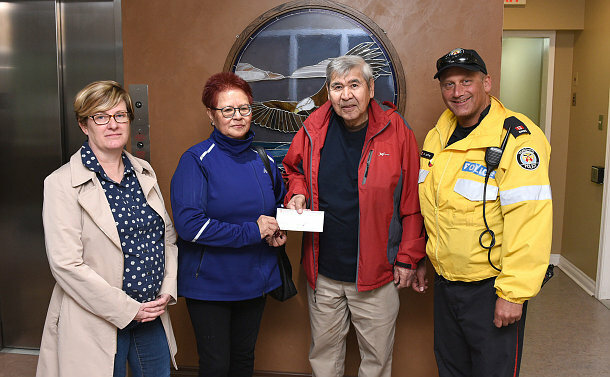 The 51 Division Aboriginal Walkabout Program has donated $500 of its Mayor’s Community Safety Awards 2017 winnings to the Toronto Council Fire Native Cultural Centre (TCFNCC) to help stage its annual First Fire Dance Showcase on May 1 at Daniels Spectrum. The program was one of five community safety projects recognized in 2017 by the City and awarded $1,000. The program pairs police officers with elders from Toronto’s Aboriginal community for a walkabout along Yonge Street and its adjacent laneways, alleyways and parks to address negative behaviours impacting local businesses and the community. As members of the Aboriginal homeless community are encountered along the way, officers and elders engage them in conversation and try to connect them with social services. This approach allows members of the Aboriginal community to see elders working hand-in-hand with police toward a common goal, keeping people safe. Constable Mike Jeffrey of 51 Division made the presentation on April 27 to TCFNCC Board designate Andrea Chrisjohn.